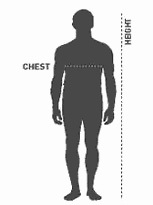 Note: If Waist is Larger than chest, you may need to go up one Chest Size. long or short, you may want to consider this. If you still have questions about your size, just give us a call and we will be glad to help.